Since all my friends were away for the Christmas break on account they have family (or boyfriends) in other countries, I decided to move my Christmas celebration to today! 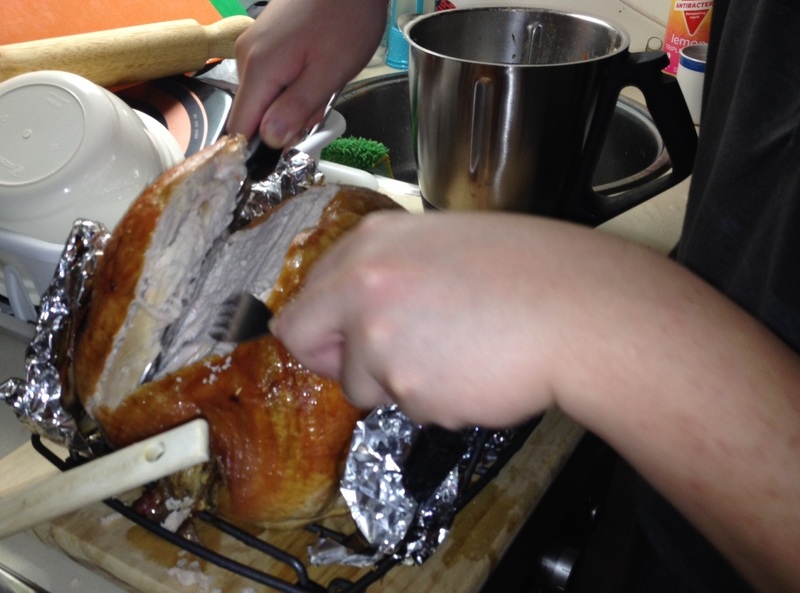 Tai attempted to carve the turkey after watching an online video about how to do it. All things considered, he did a really good job of it. The stuffing is my mother’s recipe and is made from a mixture of brown and arborio rice, peeled chestnuts and parsnips cooked in chicken stock and white wine, then shoved into the cavity of the turkey and baked. First, soak the brown rice for at least 1 hour, then wash and mix it with the white rice. After mixing, dry the rice out slightly and put it in the wok with the vegetable oil. Pearl the rice, then add the parsnips. Mix the white wine and chicken stock together, then put a 1/2 cup of the liquids into the rice in the wok, keep stirring until the liquid is absorbed by the rice. Add the chestnuts, then the remaining liquids, 1/2 a cup at a time until all the liquid has been fully absorbed. Now, you have two choices. You can either stuff the stuffing into the turkey cavity, or for a stronger turkey flavour throughout, stuff it between the skin and the breast of the turkey. I made crudtons of the stuffing, so there was a bit too much to put in the turkey, so I cooked the rest in the liquid that came out in the dripping tray (though I saved quite a bit for the gravy as well). We also had roasted pumpkin, sweet potato pie and a plethora of delicious soft drinks. Unfortunately, due to rapid consumption, I was unable to gather photographs of the remaining foodstuffs. Blame my friends. In any case, a Happy New Year to all, and may you make sensible resolutions that you don’t break! Here’s a video that J and I made last year as a rainy day advent activity when he was 4 years old. The little paper figures used to form the nativity scene are free printables from the incredible Made by Joel, but I made a couple of extra little figures (the untidy looking ones) to add to the cast. This year, Made by Joel has a new and improved free printable nativity with many extra figures! It makes for a great colouring sheet and would be brilliant if you’ve got kids coming round for Christmas dinner and you want to keep them busy. It’s one of the first videos that I’ve ever made, so it’s a little bit raw at the edges, but I love hearing J’s little boy voice in it! He built the sets out of Duplo blocks, did all the animating and the narration by himself. All I did was hold the camera in the same place. I should probably think about getting a small tripod at some point. So this morning, our Christmas Advent activity was to decorate the front door with paper snowflakes using recycled paper. We followed these foolproof instructions to make six-pointed snowflakes. J and Little E helped to make the snowflakes and arrange them on the front door. 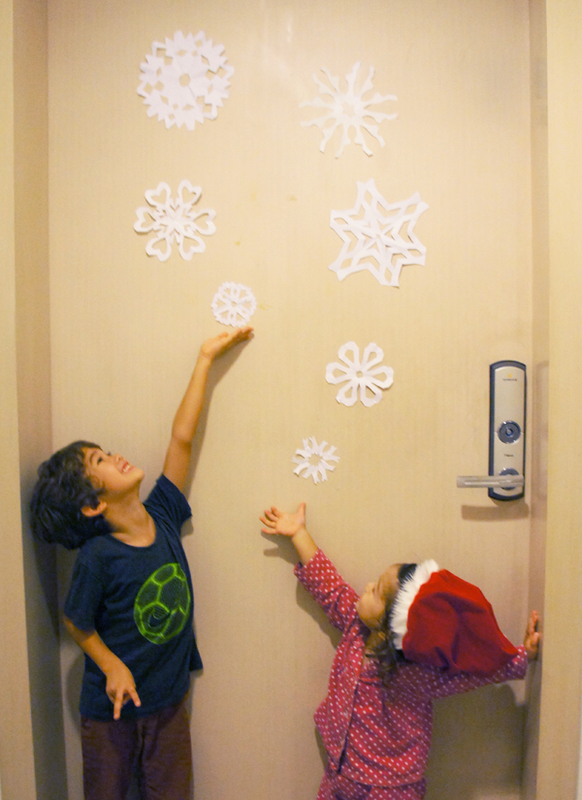 My original plan was to scatter the snowflakes randomly all over the door, but as you can see, we’ve arranged it such that the little snowflakes are close to the kids, with the bigger snowflakes higher up. This is because Little E wanted to pretend to be like Queen Elsa from Disney’s ‘Frozen’, making the snow appear to rise from the palm of her hand. By the way, if you haven’t seen the movie yet, you really should! We watched it again last week and it looks really good in 2D too. You can check out my spoiler-free review here. P.S. If you’re looking for some last minute Christmas decorations, look here for a bunch of my favourite free printables and craft ideas. P.P.S. I nearly used these awesome Game of Thrones inspired snowflake templates by Krystal Higgins but they are a little bit too challenging for preschoolers who are still mastering their scissor skills. I particularly like the House of Baratheon snowflake. Ours is the Fury! In our family, Christmas parties are always filled with music and singing and this is one of the reasons why I always look forward to the end of year festive season. Every year, we would always find ourselves gathered around the piano after dinner, singing all our favourite Christmas carols, songs and hymns together. I really hope that this family tradition will continue as my kids grow up. If you are throwing a Christmas party this year, here’s the Owls Well Christmas 2013 playlist featuring our handpicked favourites from Youtube! It’s nearly two hours long, so you can just put the music on in the background in the dining room, screen it in your living room and let your guests be entertained by all the brilliant and beautiful music videos…or better yet, sing along to all the songs if you can! In which the kids try their hand at sandblasting glass and I have an epiphany. Although J and Little E have a mixed heritage and are fairly fluent in English, I hope that they will still be able to learn mandarin chinese as a second language. I try my best to read mandarin storybooks to them at home and expose them to mandarin songs and cartoons, but my ability to give them a solid foundation in the language is extremely limited. So, when Dan Tang, the co-founder of KidStartNow, invited J to attend to attend a mandarin immersion holiday camp at KidStartNow, I was so grateful for the offer! The holiday camps at KidStartNow run over 4 days (3 hours a day). 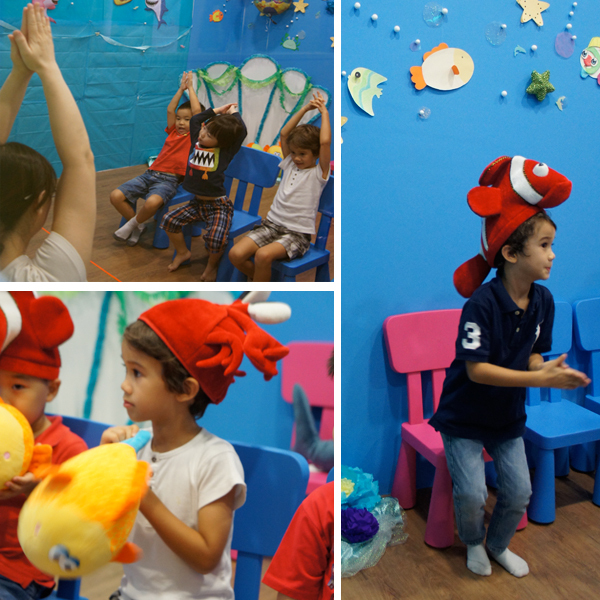 The camp encourages kids to learn mandarin through the use of animated storybooks, games, crafts and music. All the Ministry of Education (MOE) registered teachers are native speakers who have experience in engaging preschoolers and are passionate about helping children develop an interest and a love of learning the Chinese language. 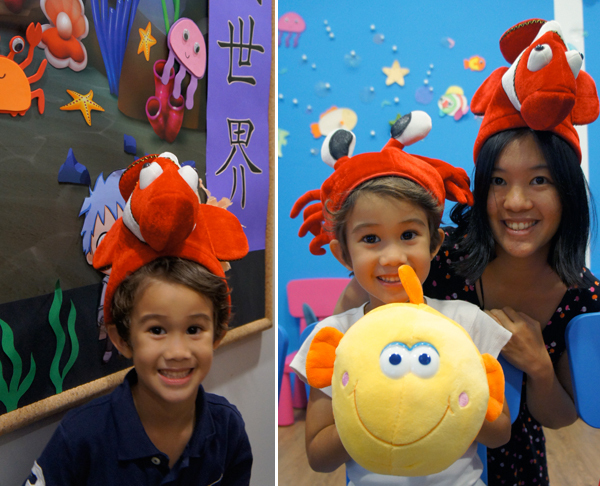 The core philosophy of KidStartNow is to motivate kids to love Chinese and make learning fun. This stems from Dan’s (the co-founder) personal experience in school, where rote methods were forcefully employed. He grew up, like many Singaporeans (including myself), to dislike learning Chinese, finding it tedious and difficult. However, after a move to Taiwan encouraged him to improve his fluency in Chinese, Dan quickly realised how much easier learning the language became. As a tech analyst, Dan also observed that technology was creeping into the lives of children and parents were finding it difficult to find that balance between preparing their kids for a digital environment whilst ensuring that the time spent on the computer is used meaningfully. He then decided to quit his lucrative career in finance in favour of sharing his passion for chinese with the next generation of students. It’s evident that Dan’s heart for helping kids appreciate and enjoy learning chinese has pervaded the atmosphere of KidStartNow. J really enjoyed his experience at the holiday camp and looked forward to attending the classes everyday. 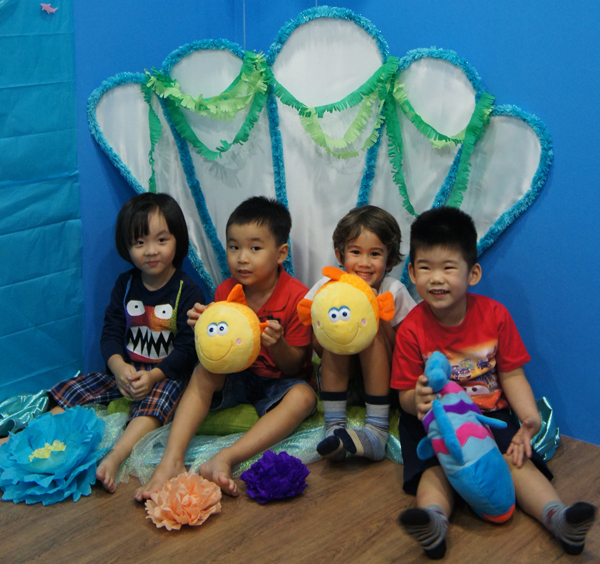 Apart from spending time and effort in crafting a curriculum based on the current Primary 1 Higher Chinese syllabus, the KidStartNow team has spared no expense in creating a comfortable learning space for preschoolers. 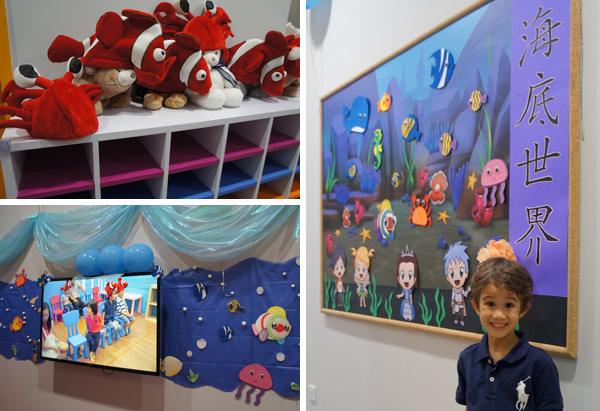 Just walking into the clean and bright waiting area of the centre, we were met with cute and colourful ocean-themed decorations – which really helped J to get all excited about the holiday camp, which was set in a fantasy sea world. The waiting room for parents had lovely comfortable sofas, and a huge screen for us to watch our children as they immersed themselves into their underwater adventure! KidStartNow creates an interest in Mandarin learning through the use of interactive, animated storybooks which are developed in-house by a team of experienced educators, creative designers and technology specialists. Below is an excerpt from an animated storybook developed by KidStartNow. I was initially worried that the entire programme would consist solely of kids goggling at a computer screen, but after observing the class and talking to my son about his experience at the camp, this was not at all the case. The ebooks (which are exclusive to KidStartNow and available free of charge to enrolled students) were used only at intervals, to introduce new vocabulary and to draw the children into the story. There were plenty of opportunities for the children to practice speaking and reading mandarin aloud by interacting with the onscreen characters and with their teacher. The kids would then play a game, complete a team activity or craft which was related to the story. Once they were successful in completing their task as a group, this would result in them being able to proceed to the next chapter. I liked the way that this made the children to learn together and encourage one another during the class, which made for a very friendly environment! I also noticed that the teachers and staff were incredibly patient and supportive of all the students, gently encouraging them to overcome their shyness (especially in the nursery-level students who experienced some separation anxiety) and rewarding their attempts to read or speak aloud in class. This really helped J’s confidence in conversing in mandarin and he seemed very excited about working hard to learn new vocabulary each day! Not bad for a kid who hardly says a word of chinese at home! Happy kids on their last day of camp! Unfortunately, all the holiday camp slots are fully booked this December (unsurprisingly!). However, if you’re interested in checking out KidStartNow, do sign up for their free trial classes which are available for Nursery 2, Kindergarten 1 and Kindergarten 2 level from January 2014! You can reach KidStartNow via email or telephone or even via their live chat support. 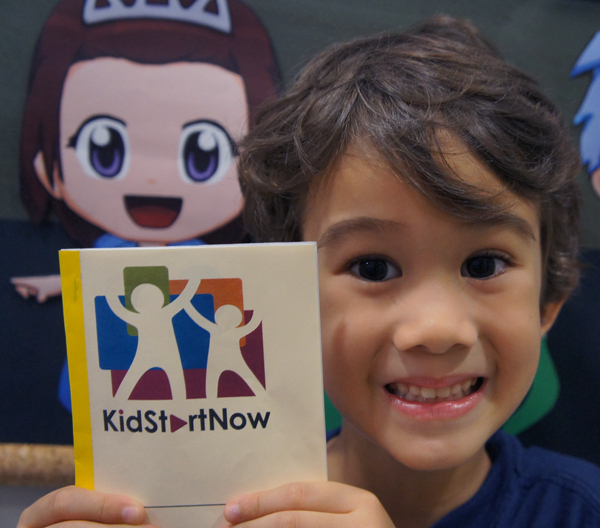 KidStartNow has also very generously offered to sponsor a Christmas Giveaway right here on Owls Well! Huzzah! 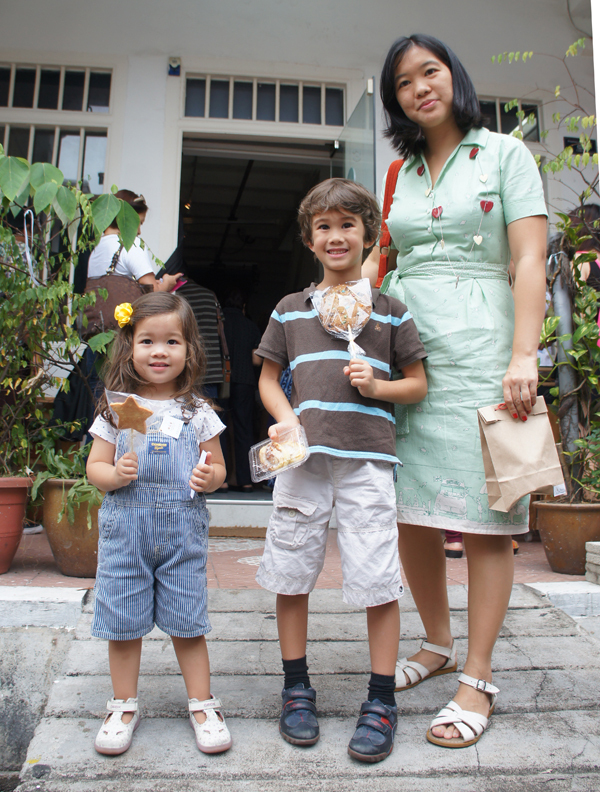 One Owls Well reader stands to win a full term of classes (12 weeks) worth up to SGD$450! This is open to Singapore residents only and closes on 25th December 2013. In which we attend the BakeOFF 2013 charity bake sale in aid of Three Legs Good, a non-profit animal shelter for injured and disabled dogs. We donated $20 and got a redemption coupon for $20 worth of tasty goodies! J and Little E had so much fun choosing delicious treats to bring home (and even more fun tasting all the baked yummies). Also, a dancing gingerbread man. P.S. Check out Three Legs Good. Li’l Brudder is waiting for a friend!